“Ban on coral trade,” reads the Fiji Times headline from January 1st, 2018. The following is a letter from Dr. Bruce Carlson, sent to Fiji’s Ministry of Fisheries and Forests, regarding the recent “Coral Trade Ban” announced on December 28th, 2017, by Fiji’s Ministry of Fisheries and Forests. 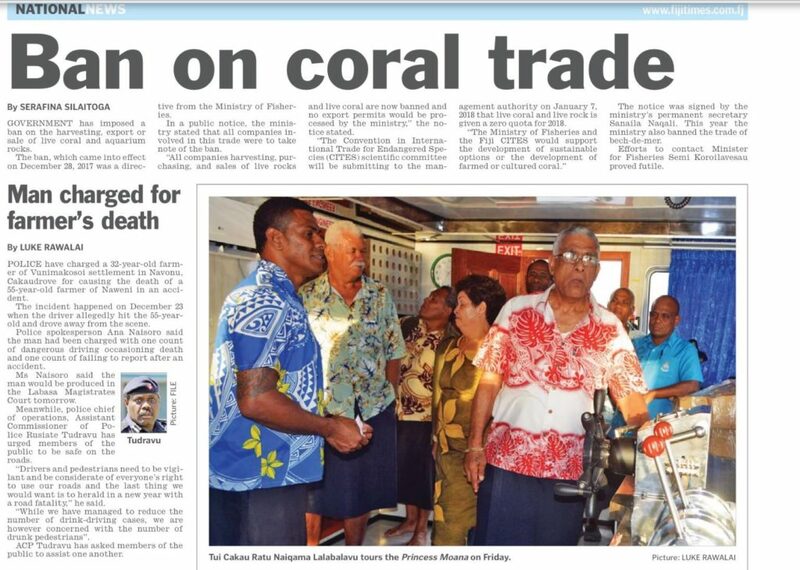 I read with great concern about the recent ban on the export of coral from Fiji. As a marine biologist and former researcher at the University of the South Pacific, I realize the need for wise conservation of natural resources, but drastic preservation measures often have severe unintended consequences that are more harmful than helpful. In this case, I believe that Fiji will realize little if any change on coral reefs as a result of the coral export ban, but it definitely will cause significant trauma to people who will lose their jobs, and to the Fiji economy, which will suffer a totally unnecessary financial loss. In the early 1970s, I and others conducted a comprehensive survey of corals throughout the Fiji archipelago under the auspices of USP, resulting in a significant increase in the number of coral species known from the Fiji Islands. These specimens form the core of the Marine Reference Collection at USP, which exists to this day. I have subsequently returned many times to dive on Fiji’s reefs, including in the year 2000, when Fiji suffered a catastrophic coral bleaching event. During the bleaching event, I set up transects on reefs off Lautoka and on the Beqa Barrier Reef to monitor the effects of bleaching and subsequent recovery. Despite variations in recovery rates, the majority of reefs showed remarkable resilience and recovered to near pre-bleaching conditions. In 2010, I returned to monitor transects on the Beqa Barrier Reef. On one transect near Frigate Passage, I counted over 800 coral colonies per transect (1 x 30 meters), or about 27 corals/m2 at a depth of about 15 meters; these were mostly young colonies averaging 4-11 cm in diameter. This was an area that suffered heavy coral mortality from bleaching in 2000. Now consider that from Frigate Passage to Cutter Passage, the Beqa Barrier Reef is about 39 km in length. A swath 30 meters wide x 39 km along the Beqa Barrier Reef would therefore yield a MINIMUM coral population estimate of 31.6 million corals. But the reef is much much wider than 30 meters, so this is a very low estimate. Also realize that this is just on the outer slopes of ONE reef. Whenyou consider ALL of Fiji’s reefs, many of which have similar coral density, the total number of corals in Fiji is astronomical – especially in comparison to the vanishingly small number exported for the aquarium trade. Preservationists argue that natural resources need complete protection from all human activity, and in some cases this is correct, especially for beautiful natural areas and for species threatened with extinction. On the other hand, conservation biologists recognize that through careful management it is possible to extract natural resources, such as coral, in a long-term sustainable manner without harm to the species or the environment. With many millions (billions?) of colonies in Fiji, coral is hardly threatened with extinction, and even after major cyclones and catastrophic bleaching events, Fiji’s reefs have shown remarkable resiliency. Hard data exist indicating that the export of live corals is clearly sustainable at current levels of collecting in Fiji. Opponents certainly have valid global concerns about coral reefs, but I suspect they have not presented data that coral collecting in Fiji is damaging or unsustainable. Tossing hard-working people out of work on the basis of non-existent anecdotal evidence, and losing millions of dollars in revenue from overseas trade, is a serious miscalculation and injustice to people and the Fiji economy. I submit that Fiji will realize little, if any, measurable effect on its coral reefs from a ban on live-coral exports. If you want to make a difference for corals, please focus on overfishing, pollution, and dredging, all of which have damaging and long-lasting negative impacts on entire coral ecosystems – not just corals. Continue working with the live-coral exporters and collect data on the reefs in areas where collecting takes place, and I am certain you will discover that this fishery is both sustainable and beneficial: to local people who enjoy employment, to the airlines who receive significant revenue, and to many thousands of people worldwide who experience learning about Fiji coral reefs from their home aquariums. I spent 7 weeks in Fiji (Jan-March 2017) and witnessed first hand the devastation of the bleaching of the coral reefs. 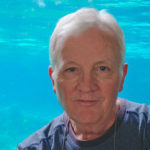 I am also very active in the salt water hobby of collecting and growing out beautiful coral from around the world. I completely support the decision to immediately stop coral collecting in Fiji as if anyone has seen first hand the miles and miles of rubble piles of dead corals and bleached reefs they would understand the need for such an abrupt decision to try to save the once gorgeous reefs. I mean it when I say that mile after mile there is nothing but death below the surface. Not all of this has been caused by the warming of water. Quite a lot of it is attributed to agricultural chemical run off as well as tour guides allowing snorkelers and divers to touch and handle the coral and live creatures in the ocean (yes, I witnessed this first hand on several snorkel trips). It is a huge step for the Fijian government to try to help revive the innocent and magnificent coral and creatures along their shores. The result of letting the coral heal and regrow will be an economic boom in the future for Fiji once again. We should ALL think about the corals we purchase from our LFS and truly try to frag what we have, trade within our local community and help save the oceans of the future. Regarding the loss of jobs of coral collectors, why not train them in coral aquaculture, and require that all future corals exported from the country be the products of aquaculture? I spent 7 weeks in Fiji (Jan-March 2017) and witnessed first hand the devastation of the bleaching of the coral reefs. I am also very active in the salt water hobby of collecting and growing out beautiful coral from around the world. I completely support the decision to immediately stop coral collecting in Fiji as if anyone has seen first hand the miles and miles of rubble piles of dead corals and bleached reefs they would understand the need for such an abrupt decision to try to save the once gorgeous reefs. I mean it when I say that mile after mile there is nothing but death below the surface. Not all of this has been caused by the warming of water. Quite a lot of it is attributed to agricultural chemical run off as well as tour guides allowing snorkelers and divers to touch and handle the coral and live creatures in the ocean (yes, I witnessed this first hand on several snorkel trips). It is a huge step for the Fijian government to try to help revive the innocent and magnificent coral and creatures along their shores. The result of letting the coral heal and regrow will be an economic boom in the future for Fiji once again. We should ALL think about the corals we purchase from our LFS and truly try to frag what we have, trade within our local community and help save the oceans of the future.